One state lawmaker talks about the importance of the average person in the political process. 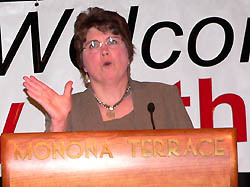 Democratic Senator Kathleen Vinehout (D-Alma) ( pronounce ) addresses a group of farmers in the capitol city, but could easily be talking to just about anyone. "When I have an issue on pharmacies I call up my local pharmacist; when I want to know about something that&apos;s affecting veterinarians I talk to my local vet; when I want to know about something that&apos;s happening to insurance agents I talk to local insurance agents. And these people are the people that are living in the real world and tell me how things really work." Vinehout, Chair of the Senate Ag Committee , says she quickly learned in her freshman year as a state Senator that taking notes, listening to opposing views from lobbyists, and asking questions simply is not enough. As a farmer herself, Vinehout explains legislators need to hear from those in the trenches, because the role of the farmer is very critical. "When you think about it, who knows better how to operate a farm than a farmer?" Vinehout says the legislature looks at hundreds upon hundreds of bills each legislative session and there&apos;s no way any lawmaker can possibly be thoroughly knowledgeable on each one of those bills. "That&apos;s why you being involved is so important. For the voice of agriculture to be heard, it has to come to the capitol in the form of a body; a person; a voice." Vinehout says change happens because the people get involved and demand that change happens. She emphasizes elected officials are there to serve the public. "The highest role in the land, Harry Truman says, is that role of citizen." During Ag Day at the Capitol , Vinehout also discusses discovery farms, large animal veterinarians, healthcare for farmers, school funding, the future of agriculture and getting a farmer on the DNR Board.